Dr. Williams was born in Idaho and raised in the Southeastern U.S. A decorated Naval veteran in the Persian Gulf during Operation Desert Storm and Desert Shield, Dr. Williams served ten years in the U.S. Navy. He has been a Boy Scout leader since 1995 and has been a volunteer for the Boise School District since 1999. He enjoys backpacking, skiing, and running with his family and friends. Dr. Williams is Medical Director of Surgery Center of Idaho. He also is a Certified Primary Investigator with the Association of Clinical Research Professionals. Dr. Williams also is a Certified Primary Investigator with the Association of Clinical Research Professionals. He is a member of the American Urological Association and the Idaho Medical Association. He is a diplomate of the American Board of Urology. 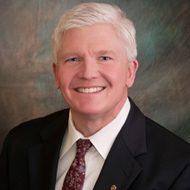 He served as a board member on the Idaho State Board of Medicine from 2011 to 2017; Past President of the Board of Directors of the Ada County Medical Society; and a Director of the Idaho Physicians Network. He is currently a Trustee representing Ada County on the board of the Idaho Medical Association. Dr. Williams has medical privileges at St. Alphonsus Regional Medical Centers, Boise and Nampa; St. Luke’s Regional Medical Centers, Boise and Meridian; Southwest Advanced Care Hospital; and Vibra Hospital of Boise. Dr. Williams sees patients in our Boise and Meridian clinics.